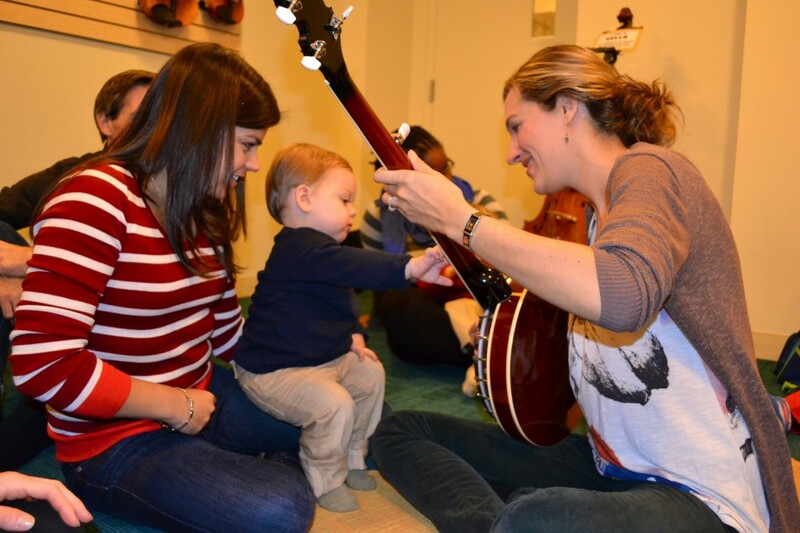 NYC Music Classes for Kids: 4 Favorites in Manhattan! Music education at an early age stimulates the brain and can improve cognitive, motor, language, and social skills. It’s also one of the most natural activities to enjoy with your child, starting with lullabies. So, it’s no surprise that a music class is most often the choice for a baby or toddler’s first class! At the Upper East Side music studio that I co-own with my best friend Katia, our classes target age-specific development goals through musical play and the benefits are apparent every day. Whether it’s a mother bonding with her baby while dancing in motion to a waltz, or a toddler learning words through song, or a 4-year-old understanding how to bow back and forth with their right hand while holding their violin’s fingerboard with their left hand- we see music stimulating and benefitting children in so many ways. Here are four of my favorite places for kids to make music in NYC. This drop- in “Live Music Plus” class is developed for a mixed age group of 8 months – 4 years. “Different musicians rotate each week so children hear a different instrument each week! Classes include singing, dancing, playing music, stories, bubbles and an open play time!” Creative Play for Kids also offers a variety of creative classes in Battery Park, Tribeca, Chelsea, Williamsburg and the Financial District. This is my company- we’re a children’s music studio and indoor playspace! We offer music classes for kids ages 4 months – 6 years. Our talented teachers introduce our little students to almost every instrument of the orchestra…up close and personal, no microphones or concert-feel here. Kids work on motor skills while playing along on age-appropriate instruments to every genre of music: in class we play Classical, Jazz, Rock, Country, Folk, Broadway, Pop, music from around the world and more! *Look by location but don’t limit yourself! If you find a music studio you love that’s a bit of a schlep for you, see if they offer drop-in classes, Saturday classes, or ask if they can prorate your class package in case you can’t make it to class every week.